Asbestos Brake Lining Rolls : Asbestos Brake Liner, Asbestos Brake Lining, Asbestos Brake Lining Manufacturers, Asbestos Brake Lining Manufacturers in India, Asbestos Safety Products. 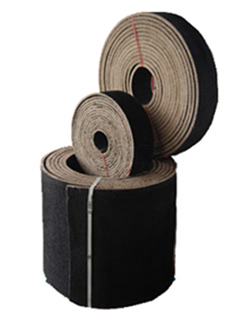 We manufacture Asbestos Brake Lining, which is a solid woven, flexible, asbestos based friction material. These are made from Asbestos yarn twisted around brass wire make Brake Lining very durable. We avail them in roll form and segments, cones and special shapes can easily be cut from it. Our range of Brake Liner is flexible material and is possible to form it to radius. Our Brake Lining has a medium / high co-efficient of friction combined with moderate temperature wear resistance. Our high quality products are made using good quality raw materials, which enhance quality and empower strength. We offer Industrial Roll Lining with both surfaces ungrounded. These products are applied in variety of brake and clutch components, industrial band and drum brake linings, industrial band, and plate and cone clutch linings. Good quality fine grained pearlitic cast, iron, Cast steel is not a Suitable mating surface but forged or cold rolled steel with a Brinell hardness of 200 or more may be used. The co-efficient of friction for design should be based upon the graph, the severity of application and maximum anticipated operating temperature being taken into account. Normal engineering practice should be followed in applying an appropriate safety factor to torque requirements of brake / clutch units. High speed steel tools are recommended for use with this material.